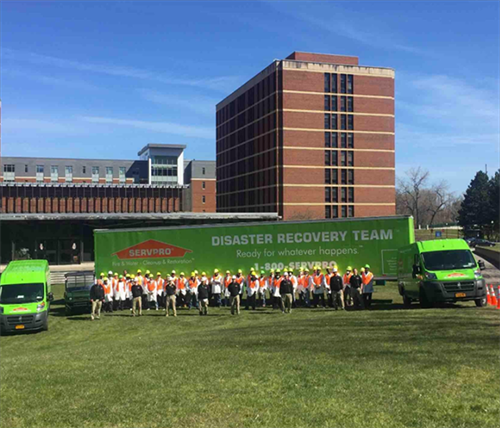 SERVPRO® is the premier Fire & Water – Cleanup & Restoration Company in the country. We are a franchise system, with over 1.700 franchises nationwide and in Canada. Each franchise is independently owned and operated. Since the start of the company in 1967, success has been built through a vision of having high quality people, who focus on excellent customer service, fairness and mutual respect. Today SERVPRO has grown to a multi-billion dollar company, with your local franchise, SERVPRO of Broome, Tompkins & Tioga Counties ranking among the top 50 franchises. We are available 24/7 and Here to Help! Our services include, but are not limited to Fire, smoke and soot cleanup, water removal and dehumidification, mold mitigation, catastrophic storm response, contents and electronics restoration, soft contents restoration, document drying, contents claim inventory service, bio-hazard & crime scene cleanup, commercial large loss and residential emergency response.